Jose Antonio Vargas spoke at the Rackham Ampitheatre last night. 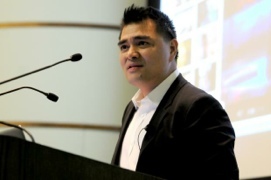 Pulitzer Prize-winning journalist Jose Antonio Vargas spoke at the University about his life as an undocumented immigrant and his desire to promote discussion about immigration through Define American, the organization he founded. Before an overflowing crowd at the Rackham Amphitheater last night, Vargas said he launched Define American to encourage conversation about immigration and tell the stories of immigrants in the United States through YouTube videos modeled after the It Gets Better campaign. He added that many people associate illegal immigration with criminality, thus it was important to collect stories from as many people as possible. Kevin Mersol-Barg, founder of the student organization Coalition for Tuition Equality and the event’s organizer, said the speech was intended to provide perspective on the struggles undocumented students face. The University restricts undocumented students who live in Michigan from paying in-state tuition, forcing them to pay the same rate as international students — three times the amount an in-state student pays. Mersol-Barg said such policies were pushing away talented students, and he said he wants to make the University accessible to all students. “It’s not just a minority student issue, but an issue for all of us,” he said. Vargas said he discovered he was an undocumented resident when he went to get his driver’s permit when he turned 16 and was told his green card was fake. His grandfather then informed him of his undocumented status, embroiling Vargas in a series of elaborate lies that allowed him to obtain a driver’s license and social security card. “It’s a dangerous thing to be sixteen in America and realize that the flag you’ve been pledging allegiance to didn’t belong to you,” he said. In 2008, Vargas was a part of a Pulitzer Prize winning team of journalists, which won the award for Breaking News Reporting for its coverage of the 2007 Virginia Tech shootings. He also wrote an in-depth profile of Facebook creator Mark Zuckerberg in September 2010. Vargas, who was initially hired by The Washington Post in 2004, quickly rose to the highest echelons of the journalism world. Last summer, Vargas finally told his story in a highly-publicized article in The New York Times Magazine to demonstrate undocumented immigrants’ diverse backgrounds and professions. « DID COMCAST CREATE A HISPANIC NETWORK?